I have my mind set on a house for Bobby and I. For some reason I do not want an apartment because I want to be able to decorate and do whatever I want & have a yard for a puppy!! Bobby isn’t quite convinced and wants an apartment, but I will be happy regardless. A huge goal of mine this year is to save money so we can make either happen and still live comfortably after bills. If anyone knows Bobby and I, you know he is definitely the money maker between the two of us, (I have had to pay tuition the last four years and just never had a lot of extra money) but since I graduated in December, I can finally help and save up money too! Plus, working full time now is great and seeing my bank account go up each week is exciting and makes my goal seem feasible. I am a couponer, and I am kinda cheap, but I never want to be someone who does not get to enjoy life because I won’t spend money. So, while I am trying hard to save money for grown up stuff, I also wanted to save money for something fun (maybe a trip). I ran across this on pinterest the other day and thought it would be a great idea! 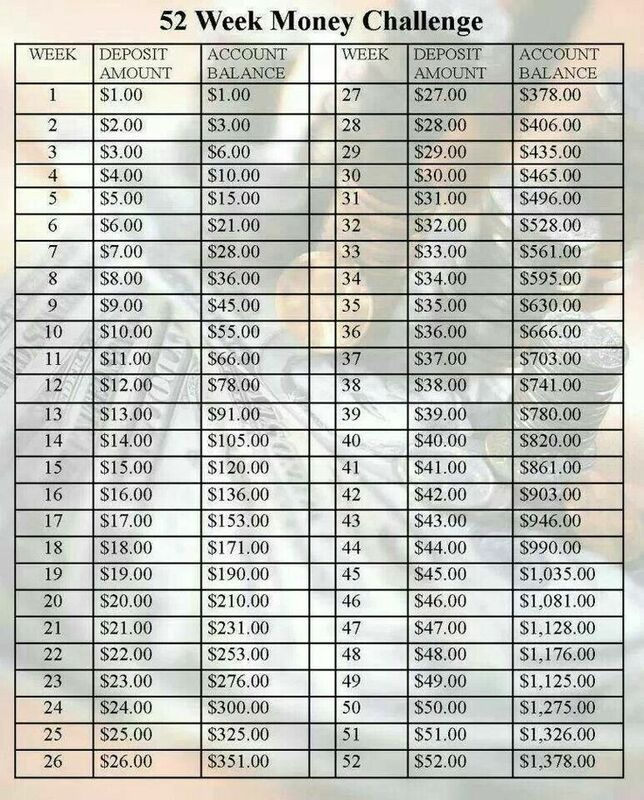 I decided to make it $20 a week though because by the end of the year, it might be harder to save $50+, especially with Christmas and the holidays. Also, it is easier to pull $20 out of an ATM then having to break bills. Another idea would be to start with $52 and go down to $1. Either way you do it, you should have enough to do something fun. $1,040 worth of fun. I think Bobby doubts that I will do it through the whole year, so I want to prove him wrong and then make him go somewhere. The boy hates vacations.. I don’t get it. I want to decorate a jar to hold the money, but I have not done that yet, but I will be sure to show you guys when it’s done! I’m thinking glitter or chalkboard paint?!? Now who is with me!?!? I’m with you Courtney! Make a jar for me and I’ll do the same exact as you :-) give mine a “Texas” or “log cabin” type? Something creative! cover a big pickle jar with rope? And make a lil sign that says -KIDS- For me! I’ll use the money I save to buy plane tickets for all you kids to come see us!!! Or all of us can go to Mexico?! :-) I love you, my beauty! YEA!Good Idea, Bobby is just gonna randomly put money in it which is still great.